Decodon verticillatus in bloom. 2004 © Peter M. Dziuk. Minnesota Wildflowers. minnesotawildflowers.info (Accessed 2/2018). Decodon verticillatus is a perennial herb from woody base, bark of submerged stems thick, spongy; stems slender 1-3 m long, arching, 4-angled, rooting at tips, extensively colonial. Decodon verticillatus leafy stems. 2003 © Peter M. Dziuk. Minnesota Wildflowers. minnesotawildflowers.info (Accessed 2/2018). Leaves whorls of 3-4, sometimes opposite, petiole short, blade 5-15 cm long, 1-4 cm wide, lance-shaped. Decodon verticillatus flowers. 2004 © Peter M. Dziuk. Minnesota Wildflowers. minnesotawildflowers.info (Accessed 2/2018). Flowers pink-purple, radially symmetrical, 4-5 parted, petals 1-1.5 cm, long, narrowed at base, attached to a rounded floral base (hypanthium), sepals short, triangular, attached to hypanthium alternating with longer, linear structures; stamens 8-10, of two sizes, all longer than petals; inflorescence of small, dense upper-axillary clusters along stems; blooms July- Aug.
Decodon verticillatus young fruit. R. Shipper. Herbarium U. Michigan. Michigan Flora. michiganflora.net (Accessed 2/2018). 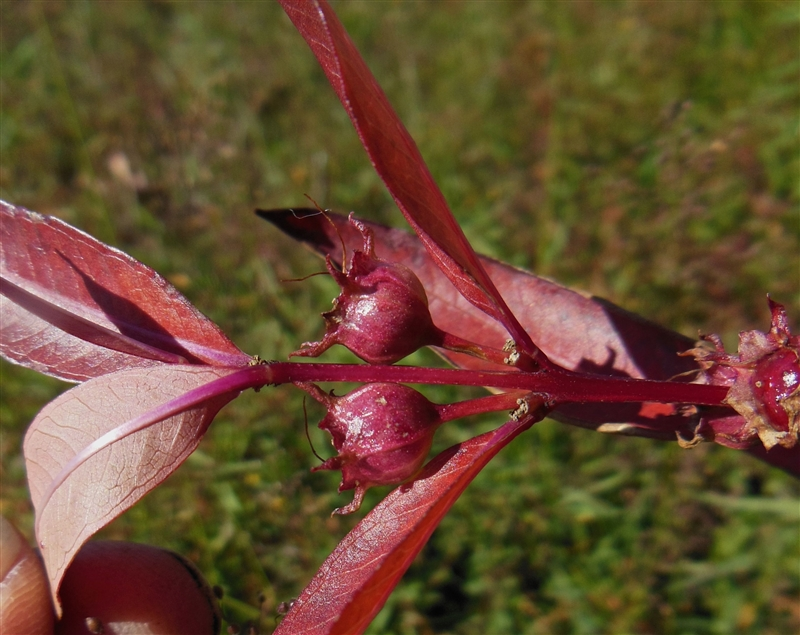 Fruit dry, a 3-parted capsule 0.5 cm wide, seeds sharply angled. Decodon verticillatus winter stems and fruit. 2005 © Peter M. Dziuk. Minnesota Wildflowers. 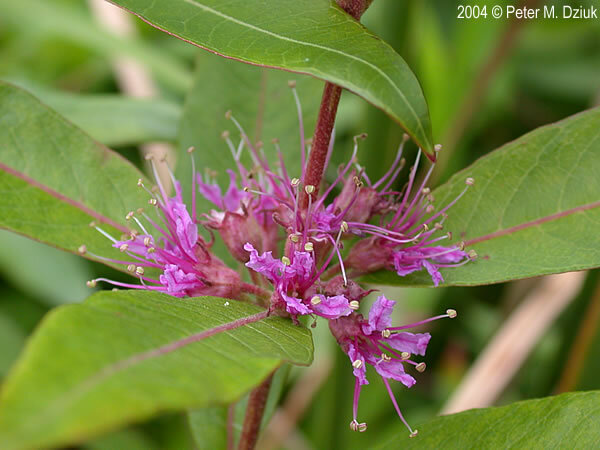 minnesotawildflowers.info (Accessed 2/2018). Frequency in NYC: infrequent. except in Richmond Co. (Staten Island). 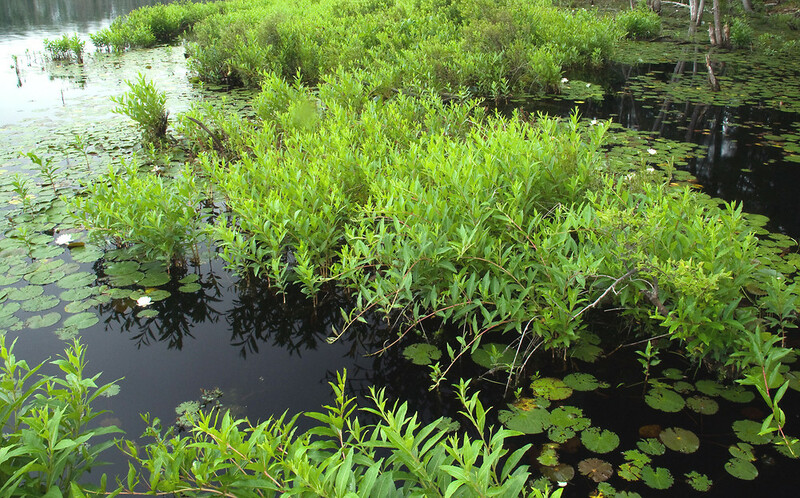 Habitat: Open, shallow water or saturated soil of ponds and sunny vernal pools. Soil pH 5.2-7.2 Tolerant of saturated soil, intolerant of salt, drought. Able to resprout after fire (USDA, NRCS 2006). 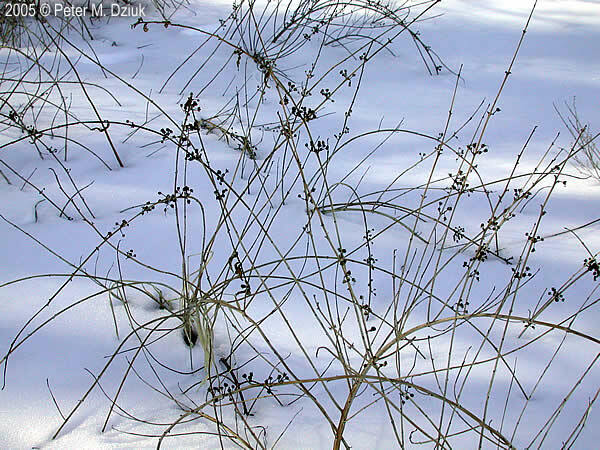 Decodon verticillatus winter habitat. Photo Bill Hubrick. Maryland Biodiversity Project. 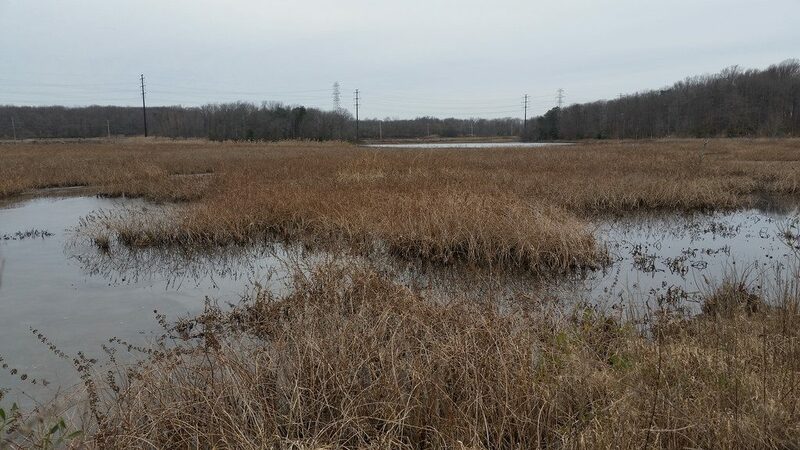 marylandbiodiversity.com (Accessed 2/2018). 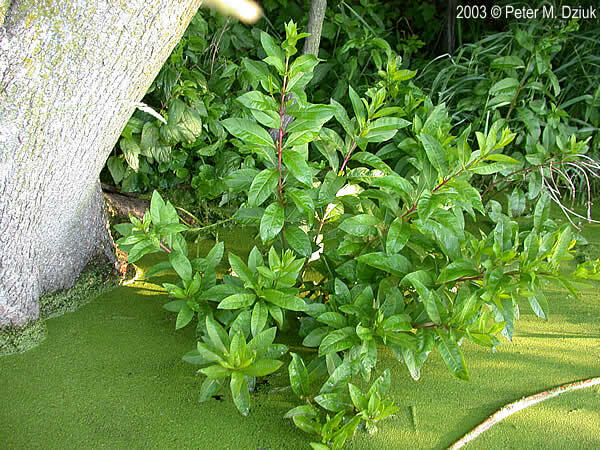 Notes: Same family as the invasive European aquatic annual plant Lythrum salicaria. 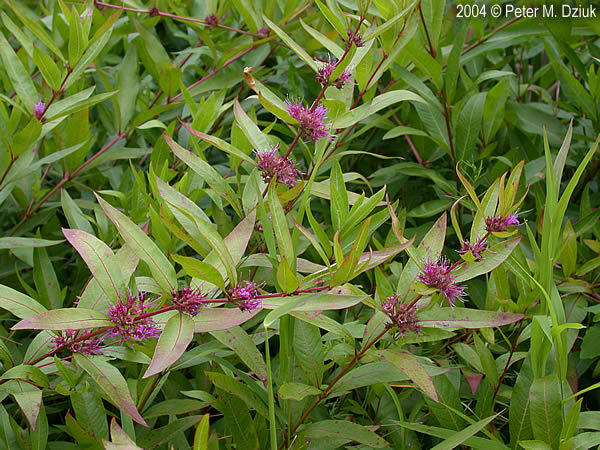 There is some concern that the insects imported to control purple loosestrife may also attack Decodon.